The International Olympic Committee has made a donation of $50,000 (£35,000/€44,000) to a giant panda breeding centre in Sichuan Province in China. 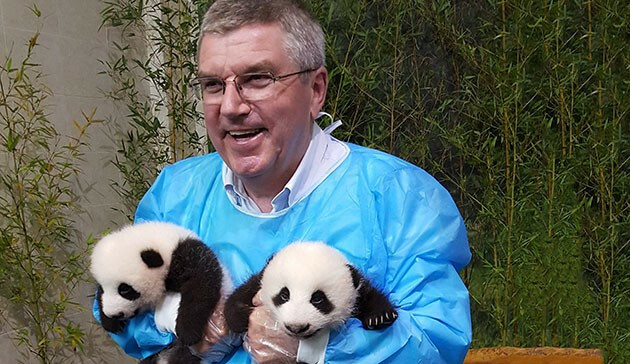 The money has been given to the Chengdu Research Base of Giant Panda Breeding and follows a visit from IOC President Thomas Bach last August, where he named two baby pandas. Bach chose "Olympia” as the name of one and the other was called "Fuwa" after the mascots for the Beijing 2008 Olympic Games. There were five Fuwas, which translates as “good luck dolls” - Beibei, Jingjing, Huanhuan, Yingying and Nini – for the Games in China’s capital city eight years ago. After the IOC President had picked the names of the pandas, the breeding centre officially confirmed the pair of cubs would be called “Olympia” and “Fuwa” earlier this year. A ceremony has been held at the Chengdu Research Base of Giant Panda Breeding to mark the donation, which was attended by IOC vice-president Yu Zaiqing. The money will help the centre continue their work with breeding and protection of giant pandas. “Following the invitation by the panda breeding centre in Chengdu for International Olympic Committee President Thomas Bach to name two female pandas last year, it was recently agreed that the IOC together with the Chinese National Olympic Committee would offer to support the nursery,” a spokesperson from the IOC told insidethegames. Giant pandas remain one of the world's most endangered species. According to the Xinhua news agency, fewer than 2,000 pandas live in the wild. These are mostly located in Sichuan and Shaanxi.